Coconut juice is the clear liquid contained within young coconuts. Up to a litre depending on the size of the coconut. This coconut juice has been appreciated as a valuable drink in the coconut’s native countries for millennia. The coconut is the only fruit whose juice can be drunk without pressing, directly from the coconut: Drill, insert straw and enjoy – if you are in the tropics. And if you aren’t in the tropics it doesn’t matter. After all, you can buy Dr Antonio Martins coco. This is organic coconut juice. As good and as delicious as it is fresh from the coconut. 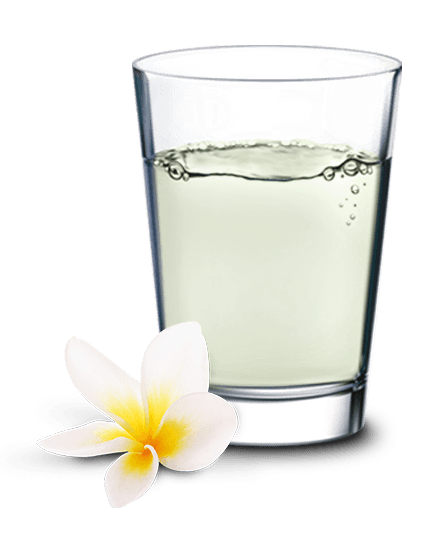 Everyone has been talking about coconut juice, also known by many as coconut water, for some time. For millennia, people have recognised just how special the drink is that comes from fruit of the coconut palm. As long as it is young. As so often in life, details matter. The juice of young coconuts is nutritionally valuable. This coconut juice is the ideal drink for a healthy diet. It contains no fat, is low in calories and has a mineral balance that your body can make optimum use of. For over ten years, Dr Antonio Martins has worked on bringing coconut juice to Europe, just as it has been appreciated in the tropics for generations. And that is why coco as a product is as unique as the juice from which it is made. coco juice is an experience. Purely natural. 100% organic quality. And of course GMO-free. 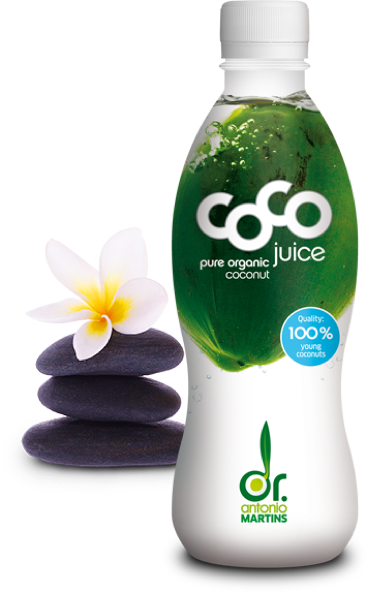 With coco you are always drinking juice that comes from young coconuts. Don’t be confused: in advertising it sometimes says “from green coconuts” – green does not automatically mean young when it comes to coconuts. For Dr Antonio Martins coco we harvest coconuts that are five to six months old. 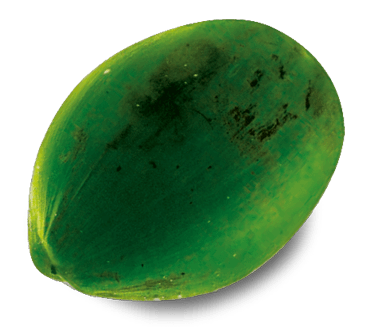 At this stage of maturity they are young, have little flesh and all of the minerals and vital substances are still in the coconut juice. As it ripens the coconut gradually stores the nutrients from the coconut juice in the coconut flesh. In a manner of speaking it consumes the valuable contents itself. A small amount of liquid remains, which often tastes musty and rancid. Anyone who wanted to make coconut juice from this would have to be a magician. 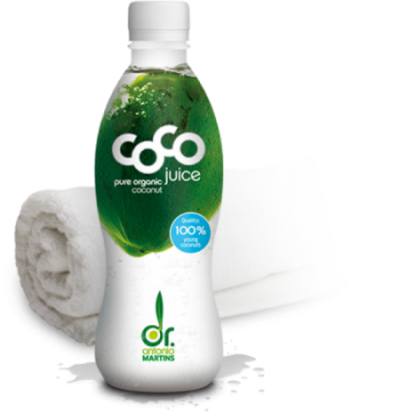 Remember to consider quality: Dr Antonio Martins consists of 100% organic juice from 100% young coconuts. And nothing else is as valuable and tasty as original Dr Antonio Martins coco. If you have never tried coconut juice, you will probably be surprised. 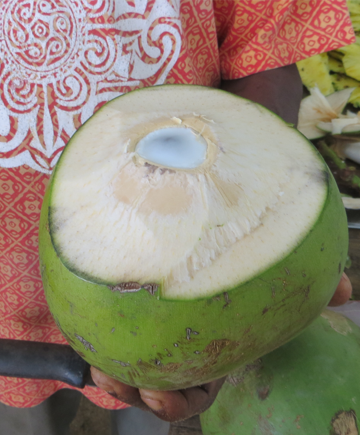 The young coconut does not contain sweet, creamy milk, but a clear, pure juice. It tastes light and refreshing. Clear and smooth. Slightly sweet, with a hint of coconut. Low in calories with valuable vitamins and minerals. Not everyone likes pure coconut juice from the start – it is a whole new taste sensation. And your palate needs a little time to get used to it. Be patient, it’s worth it. And don’t be surprised: coconut juice from young, top-quality coconuts tastes much less strongly of coconut than you would expect. Quite refreshingly sharp, like young apples. But you know about quality – that’s why you are here on our website. You will often come across different names for the same natural product. Coconuts only grow in the tropics. And the liquid contained in young coconuts is drunk particularly in Portuguese-speaking Brazil – as “agua de coco”. Which translates as “coconut water” in English and “Kokoswasser” in German. To us the name coconut water is very misleading. Water comes from the tap and contains no noteworthy substances. However, the liquid from the young coconut is the juice from a fruit. More specifically, from a drupe. The botanical literature correctly states that, “coconut juice is the liquid contained in the one-seeded drupe, the coconut”. Juice is high-quality, full of beneficial substances and we think the association with water does not do it justice. So to be clear: coconut juice. Out of respect for the unique product that Mother Nature has created for us. Wherever coconut palms grow, coconut juice is always consumed. People swear by the health benefits of coconut juice and drink it at every opportunity. The fresh nuts are chilled well, drilled or cracked open at the top, and drunk dry with a straw. When you visit the countries the coconut is native to, you will be offered young coconuts for sale on almost every street corner. Just help yourself. A unique taste sensation awaits you. You’re not lying in the tropics under the palm trees? It doesn’t matter, you can always buy yourself Dr Antonio Martins coco. In practical plastic bottles to take with you. Or in various cartons if you are especially thirsty. And if you are looking for a change, you’re even luckier than the people in Brazil – because coco is also available mixed with fruit and with fruit flavours. Voila: coconut juice is made for you if you do sports. Coconut juice contains valuable vitamins and minerals. It is fat-free and, with just 19 kcal per 100 ml, coconut juice is much lower in calories than most other juices (and even juice spritzers). According to many studies, coconut juice has an isotonic effect due to its nutritional properties – it can compensate for mineral losses much better than pure water. Just compare the mineral content of water with the corresponding details on your coco packaging. And that’s not the only good thing about coconut juice: It is exceptionally smooth and light to drink. Slightly chilled coconut juice is uniquely refreshing – not as harsh as many other drinks. Dr Antonio Martins coco is not carbonated, so it is the perfect drink for activities like yoga, in the fitness studio or for other sports that make you sweat. 48% of the recommended daily allowance**Reference quantities for the average adult (8,400 kJ / 2,000 kcal). Few other foods act in such harmony with our body as coconut juice from young coconuts. People in the tropics have always sworn by the health benefits of this unique, purely natural product. Coconut juice also helps with the prevention and treatment of a wide variety of disorders and illnesses. Unfortunately we cannot give any health advice here, but if you do a little research on the internet, or ask around among friends, you will discover many beneficial effects that people attribute to coconut juice from their own experience. You can also talk to your doctor about coconut juice. And even if you a very sceptical person who prefers to rely on scientific facts – coconut juice is not a drug; coconut juice is a natural product that may at least play its part in keeping you healthy, as part of a balanced diet and a healthy lifestyle. ( > Medical studies – here you can download a variety of scientific and medical texts and information on the topic of coconut juice and medicine – you will be surprised). In an emergency, coconut juice directly out of the fresh young nut has even been used as an infusion solution. This is because the juice in the coconut is completely sterile, contains no known allergens and its mineral balance almost exactly matches the human body.